The speed limit on Sheridan Road is currently 30 mph. Council voted Monday to lower the speed limit to 25 mph. Aldermen unanimously decided to lower the speed limit on Sheridan Road Monday night, decreasing it from 30 mph to 25 mph. 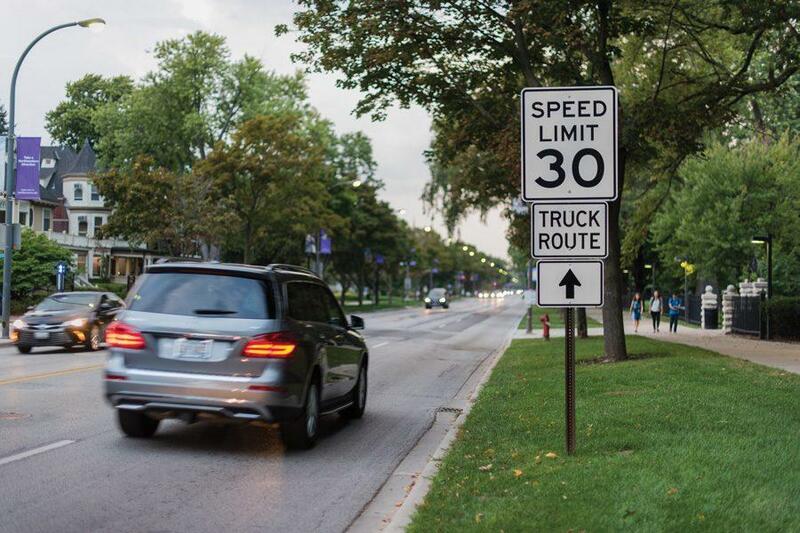 A motion to consider lowering the speed limit passed last month after students, faculty and aldermen called for action following the death of first-year Chuyuan Qiu in a biking accident on Sheridan Road in September. The limit will be reduced from South Boulevard north to the city limits. According to council documents, the area south of South Boulevard is under control of the Illinois Department of Transportation, and thus the city has no control over the speed limit. The city has sent a request to IDOT to lower the speed limit on Sheridan Road south of South Boulevard. After Qiu died, Communication senior Emily Blim made a petition calling for the speed limit reduction, and Associated Student Government and Faculty Senate passed resolutions calling for the reduction. Ald. Judy Fiske (1st) said Sheridan Road used to be safer. But with shuttles and construction vehicles intermixed with everyday traffic, she said Sheridan Road now serves many purposes for residents and Northwestern construction teams. Now, she advocates for making Sheridan Road three lanes: one for each direction of traffic and one a shared turn lane. “(Sheridan Road) was designed as a pleasure drive. It was designed to be quiet. It was designed to be the front yard of the university,” Fiske told The Daily at Monday’s meeting. SESP sophomore Ben Powell also advocated for the speed limit reduction in October. Powell also recommended greater action, suggesting Sheridan Road could be used more as a “public space” with no vehicular traffic in the future. ASG’s resolution recommended a task force to examine safety on campus and the possibility of closing Sheridan Road to through traffic. “The problem with Sheridan is it’s people (driving) who have no interest in the university, are not going to anywhere at the university, have no involvement with the university and may not live in Evanston or Chicago,” Powell said at the October ASG Senate meeting. Fiske said the proposed bike lane plans slated for 2017 construction will be beneficial, but they will also widen the street and might not serve to make the road safer. She encouraged students to come to council meetings and voice concerns for aldermen to consider when making decisions. ASG President Christina Cilento spoke to aldermen when the ordinance was introduced in October. Cilento said policy change can influence infrastructure development, which can then affect culture. She also said if policy becomes less accommodating to car traffic, then people may not drive as much.